Like its predecessor, Pump is a pop album. Even more of one, actually: four hit singles this time, as opposed to Permanent Vacation’s three. Also like its predecessor, it features a few of-the-time production choices that have not stood up well over the years (reverb, REVERB, REVERB!) Happily, this is where the comparison ends: Pump is focused, consistently well-written, and most importantly it feels like a true Aerosmith album. One crafted (cannily, it can be argued) for a different audience than the so-called “blue army” that made up the band’s core audience in the ‘70s, but a true Aerosmith album just the same. Apart from the simply better songs, the main difference here is Steven Tyler. Flush with success from his last at-bat, no longer seems to feel the need to hold his tongue or his tonsils. His singing is absolutely superb throughout the record – arguably, it’s his best ever – and the lyrics once again manage to be both dirty and clever. The example can be perfectly underlined thusly: compare “Rag Doll”, Permanent Vacation’s sleaziest moment, with “F.I.N.E.”, its (shall we say) spiritual companion on Pump. It’s not even remotely a fair fight: while the former finds Tyler mostly reduced to merely yelling “do me” a lot, the latter unleashes a veritable torrent of fingerprinted filth that couldn’t have possibly come from anyone else’s mind. It would be horribly offensive, if it weren’t so dazzling and amusing. That’s our boy. What truly sets Pump apart from all other latter-day Aerosmith albums is that it’s the last time the band truly sounded hungry. They all perform here as though their very lives and careers depend on it; as though they are primed to prove to the world that their resurrection last time around was no fluke. Although the four hit singles (“Love in an Elevator”, “What it Takes”, “Janie’s Got a Gun”, “The Other Side”) have, with the exception of the eternally underrated last of those, long ago been played out by radio, they still don’t feel quite as stale as those from Permanent Vacation. Where Pump still truly has the capacity to amaze is in its lesser-known material: the one-two punch of “Young Lust” and the aforementioned “F.I.N.E.” is one of the great album-opening sequences of the ‘80s. “Voodoo Medicine Man” re-introduces funk rhythms to the band’s arsenal in a big, bad way, and “Monkey on My Back” just flat-out rocks, man. If “My Girl” and “Don’t Get Mad, Get Even” feel ever so slightly like filler, I’m willing to cut ‘em a bit of slack: they’re great filler, and both fit the overall flow of the album. 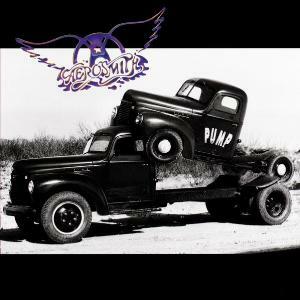 This time around, the summation is simple: Pump was Aerosmith’s last absolute triumph of an album. Its quality and concision – at just over 45 minutes, it’s got perfect timing – should have served as a template for the rest of the band’s studio career. In fact, I’ve never quite understood why it didn’t, but we’ll get into that next week.